CBC posted Still don’t own a smartwatch? You’re not alone. First, let me say I agree with the author that not everyone needs or wants a smartwatch. I certainly don’t need one, but did want one. I got an Apple Watch as an early birthday present last September or October. And I really do enjoy it. Other than time, there’s a few things I use my Apple Watch for every day. Added up, I’m very happy with the purchase. I’m not sure I’d get stainless steel again, but at the time I was worried about the glass screen. I wear it whenever I’m awake. Movement reminders. My job is sitting at the computer. I could have my computer remind me every hour to stand up (in fact, I used to do this) but having the watch monitor me means I’m only reminded in hours I’ve been sitting. Unlocking my Mac. I can’t believe I forgot this in my first draft! I type my computer password in once per day now. The rest of the time the computer just sees the watch beside it and lets me in. If I take it off the charger at 6am it’ll usually last until 6pm the next day. But if I forget to charge it overnight, charging it while I get ready in the morning will guarantee it makes it through the day. 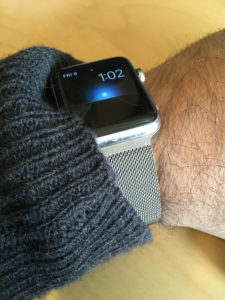 Current Canadian starting price is $399 for the 42mm version of the Series 1. While her battery makes it through the day (at least since one of the earliest updates), I don’t think there’s any way she’d get 36 hours out of it. She doesn’t wear hers at home a lot of the time, but puts it on if she’s going out. At work she’s able to read messages throughout the day, which she wouldn’t be able to on her phone. If she’s out for fun, she uses it to screen notifications and calls as well since it requires less of her attention than fetching the phone. She doesn’t care about sunrise/sunset, and uses the Butterflies face instead. She also uses it for Apple Pay. But this is more critical for her, since she carries a lot less at work. Luckily she works at a restaurant, so if it fails for some reason I get to pay when I pick her up. This has happened only once or twice, and only in the early days or when we’ve got new credit cards. Her fluoroelastomer band discoloured after about 11 months. Mine was still fine. This might be the chemicals she works with, but it might just be that the lavender colour doesn’t hold up as well. We picked up a replacement nylon band. This is both absolutely right and wrong, because it presents but ignores the use case: You can do it from your wrist without pulling out your phone. If you don’t mind picking up your phone whenever it demands your attention, great. You can trim the notifications down a lot, after all. But if you want to put your phone in your pocket and keep it there most of the time, at your desk or while out… that’s a big part of what the watch is for. You can decide if it’s worth the money for you, but it was for me. Aside from the stand notifications, I haven’t even started the fitness stuff. That’s still to come.